Las Vegas homebuyers are not only looking forward to the opening of William Lyon Homes’ new Allegra community in Summerlin, they’re also looking up — literally. Its location in The Paseos village of Summerlin on the western edge of Las Vegas offers views of the Las Vegas Valley. From Allegra, residents will enjoy all the amenities of the surrounding area, including the nearby mountains and Red Rock Canyon National Conservation Area, which features miles of hiking, biking and running trails. Sophisticated shopping and dining is open at the Downtown Summerlin mall. And The Paseos neighborhood is flanked by two 16-acre community parks that include picnic areas, soccer and T-ball fields and sand volleyball and basketball courts. It’s all within easy access of schools, office and entertainment areas and the I-215 Beltway. “With a location this unique, it was critical for us to put our best foot forward in the design of Allegra,” said Linda Kemper, vice president of Forward Planning for William Lyon Homes. “Toward that end, our creative team envisioned floor plans that would optimize the outstanding topography of the neighborhood. Three two-story plans are offered at Allegra that range from 2,900 to 3,300 square feet. Each plan incorporates generous gathering spaces with bar areas in its design. Preopening pricing will begin in the low to mid-$500,000s. 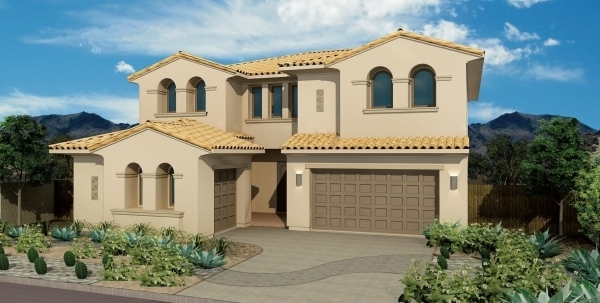 Only 87 homesites will be offered in this gated community found within The Paseos at Summerlin. Plan One at Allegra includes a master suite on the first level in its 2,900 square foot design. Access to the home is gained through a covered exterior entry and through a foyer that ushers visitors into a voluminous, light-filled great room. This scene may also be framed by optional multislide glass doors to showcase the covered loggia, accessible from all three interior spaces — dining, great room and master bedroom. As many as three additional bedrooms, plus a loft are on the second level, along with two covered miradors at the rear. Plan Two is nearly 3,100 square feet. Visitors are initially greeted by a covered entry courtyard and foyer that opens onto a grand design of gathering space. The great room, dining room and kitchen occupy the entire rear of this plan, which is complemented by an expansive covered loggia. One bedroom is on the first floor with a private bath, while the master suite and two additional bedrooms are found upstairs. High-volume ceilings rise above the great room and the foyer to the second floor, accentuated by a dramatic staircase configuration. Allegra’s Plan Three has a more traditional appeal in more than 3,300 square feet. With the addition of a formal dining room, it’s a design that lends itself easily to casual comfort and elegant entertaining. A massive great room with second-floor volume offers a multitude of uses, especially with the adjacent covered loggia which occupies most of the rear of the home. The kitchen and a bar complete the interior first level, along with an oversized three-car garage. The master suite with its own covered mirador is on the upper floor, along with up to three additional bedrooms. William Lyon Homes Design Studio in Downtown Summerlin offers extensive upgrade customizing opportunities from floor to ceiling. Models are under construction with an onsite trailer. An interest list has been forming for months. To visit, exit the I-215 Beltway at Far Hills Avenue, head west and follow the signs to Allegra. For additional information, call Maria Bengtson at 702-604-1353 or visit LyonHomes.com/Nevada.